What's new? > Are you planning to build a patio this summer? Are you planning to build a patio this summer? 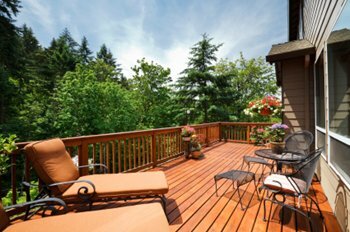 You are planning to build a patio this summer and you don’t know where to start? No worries! The Virtual Constructor is there to help you properly in every step of the way for this project. Indeed, it’s now possible to plan and get a budget for a patio building project, using the Virtual Constructor. Simple and user-friendly, you can create your dream patio from now on. You can also add a privacy screen, a pergola, stairs, stair railing, and more. Determine the dimensions of the area and place, for example, your dinning table while visualizing the space that surrounds as well as the layout of your furnitures and your garden accessories. At each step, to the disposition of the joists to the coating floor, you can immediately view your modification in 3D. Then, print the material list in order to request a quote to a hardware store in your region that will be pleased to help you. The Virtual Constructor is an free online application, simple and easy to use. It has never been so fun to plan and estimate your construction project.